When the 2017 Oscars rolled around and La La Land was in the spotlight, there was a spotlight somewhere else, too. As US Magazine pointed out, Ryan Gosling and Eva Mendes have been one of Hollywood's hottest couples since 2012, but they are still making Hollywood wait to see them together on the red carpet. When Gosling made his acceptance speech, he did give the world a glimpse into their private life with a shout out to Mendes, but that only fueled the fire of curiosity when it came to just why the stylish actress continuously gives red carpets a miss. So what's going on there? While it can't be easy to spend so much time in such a bright spotlight, there was something that seemed to happen when Ryan Gosling and Eva Mendes hooked up in 2012, and E! News took a look at just how private they really are. According to them, there's plenty of appearances, photos, and even red carpet appearances that they both did prior to the start of their relationship and even a bit at the beginning. They were on the red carpet together for The Place Beyond the Pines, the film they met on and promoted together. After that, the magazine notes they sort of retreated from public life as much as possible — at least while on each others' arms. They also found that Mendes has an almost strange dislike of talking about Gosling, and hardly even acknowledges him on social media. She's stopped interviews where she's been asked about him, and when a reporter from The Edit asked her about Gosling in 2013, she was quoted as responding, "I'm sorry. I'm shutting down. I'm such a weirdo. I literally lose my ability to speak — and you were doing so well." When it comes to his turn in front of the media, he's said that she doesn't like him talking about her or their relationship, either. With the arrival of their daughters, she's even more strict about protecting their privacy. During her pregnancies, she said she was absolutely staying out of the public eye — and off the red carpet — because becoming a parent made her even more wary of privacy issues. "[...] I find the media's 'bump watch' obsession to be both intrusive and stressful," she said in 2014. "So I made a decision to eject myself from it completely. I was like, 'Annnnd I'm out.'" Given how private Mendes and Gosling clearly want to keep their relationship, it's really no wonder the bright lights and extreme close-ups that come with the red carpet walk would be something they want to avoid. Strangely, he seems to avoid something else, too: saying her name. E! News pointed out that Gosling's acceptance speech for his La La Land awards was a bit odd. Rather than thanking her by name, he referred to her as "sweetheart" and "my lady". That's not the only time he's done it, too, and according to them, Mendes — and his daughters — are rarely mentioned by name. Another piece from E! News noted that some fans find a rather misogynistic air that comes with his refusal to refer to her by name, and even have gone so far as to suggest that means he's clearly putting his career first. While that doesn't seem to be the case, it does show just how fiercely private they really are. Maxim was quick to point out that Ryan Gosling stirred up no small amount of gossip when he showed up to the 2017 Oscars with a blonde woman who was clearly not Eva Mendes on his arm. While her identity was quickly revealed to be none other than his sister, it turns out he isn't the only one walking his red carpets alone. In March of 2017, Mendes made her own red carpet appearance at the opening of a New York & Company store in Miami. Mendes has turned her attention more toward fashion and beauty instead of acting, and as a designer for the company, she was on hand to help open the doors to the new store. If that wasn't enough to get her to stroll down the red carpet — alone — the store's location in her hometown of Miami was a clincher. W Magazine was there to see it, and quoted her as saying, "It is such a thrill to open more stores, especially in the Miami area. I was born in Miami, so this city has always been dear to me." It was certainly a much more low-key event than the Oscars, but it seems as though she's absolutely fine with that of late. There's nothing quite like seeing stars as they were when Hollywood's idea of fashion was very, very different, and in 2015 (via E! News) she shared a #tbt photo from her Instagram that showed her in her very first red carpet appearance. It was in 2001, and she was there for the film The Others. There's no doubts that a lot can happen in just a handful of years, and she's come a long way since then. Mendes wrote, "The debut of my latest @nyandcompany collection has me throwing back to my first red carpet. I did my own hair and make up and that's a $6 dress from Goodwill. I've always loved a cheap find. Viva thrift shops! #tbt"
Mendes might not be seen on the red carpet with her other half, but according to ET, she's still occasionally stepping out to join him at various events. She — and they — seem to just want to keep it a personal, behind-the-scenes sort of thing, and there's nothing wrong with trying to enjoy a bit of the privacy that many people take for granted. 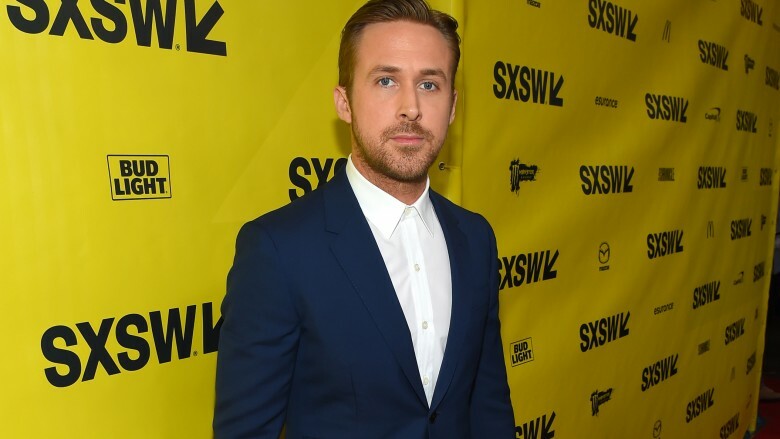 Gosling was walking the red carpet alone at the South by Southwest film festival in March 2017, where his film Song to Song was premiering. While there are no photos of the pair together, she did post a picture of the Paramount on her Instagram, suggesting that she was there and perhaps took a less direct route into the theater. People reported they had confirmation she was definitely there and had checked into a hotel not far from the festival. She may not want to be front and center on the red carpet, but she's certainly lending her support in other ways and at other times. When Shape magazine talked to Mendes about everything from her workout schedule to what she starts her mornings with (eggs, preferably), they also got a rare comment about her personal life. At the time, Gosling was busy accepting awards for La La Land, and questions about Mendes's role were flying. According to what she told them, though, her biggest reason for giving the red carpet a miss is simply that she'd choose home over Hollywood any day. "What people don't know about me is that I love being home," she said. "Instead of hitting the red carpet, I'd rather be with our girls." It's a straightforward, simple answer that just might be the truth. For now, everyone's left to speculate on just when they'll be appearing in public together and whether or not we're going to have photos of the happy couple strolling down the red carpet together, but given the lengths to which they seem to have gone to in order to keep their relationship on the down-low, they'll likely continue to do so.